The current Ford Super Duty was only introduced for the 2017 model year, but already the Blue Oval is working on updating the design and some of the technology behind its venerable F-Series workhorse, recent spy shots have revealed. The spy photos, which you can view over on Motor1 at this link, show a single cab, long box prototype along with a quad cab short box dual-axle prototype. It looks as though the single cab truck is an F-250, while the larger truck is an F-350, although it’s hard to say for sure with all of the camouflage the pickups have on. Ford was so serious about the camouflage on this prototype, they even went and camouflaged the side steps. From a visual standpoint, it doesn’t look as though major changes will be in store. The Super Duty retains its general silhouette, along with Ford’s recognizable window ‘notch’, but you can but that a facelifted front and end and slightly revised tailgate are in store. New headlights and taillights should also appear, along with some other small changes such as new paint and wheel options. According to Motor1, the new Ford Super Duty could spell the end of the 6.8-liter V10 in the truck, with a 7.0-liter V8 allegedly set to replace it. 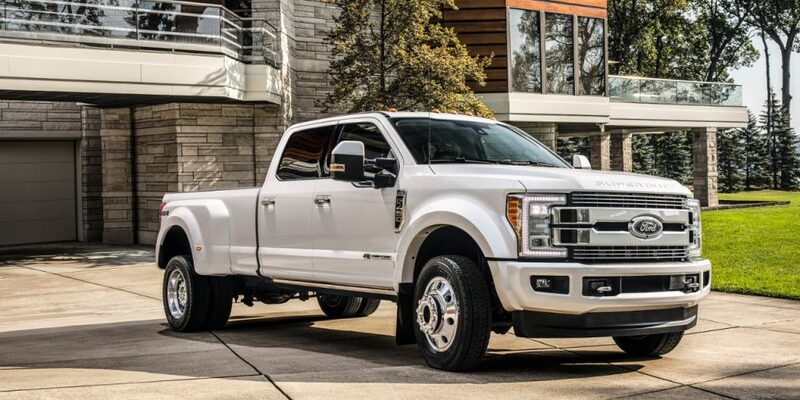 The 6.7-liter Powerstroke diesel is expected to carryover unchanged, while the 6.2-liter V8 is expected to die off. Ford’s 10-speed automatic transmission, which has only appeared in the F-150 thus far, is also rumored to work its way into the heavy duty version of the F-Series when it arrives in 2020. Look for the 2020 Ford Super Duty to makes debut sometime in late 2019 or early 2020 before going on sale in the United States and Canada shortly after. Be sure to stay tuned to Ford Authority for more Ford Super Duty news as it becomes available.